Wonderfully detailed soft plush with a beautiful face and expressive eyes. A story hang tag tells about red river hogs. From the Leosco Save Our Space Collection. 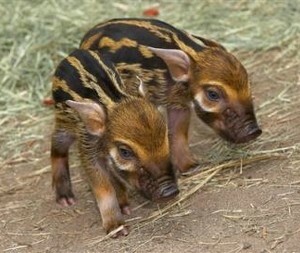 (AP Photo/The San Diego Zoo, Ken Bohn) In a photo provided by the San Diego Zoo, two male red river hogs make their debut Monday, May 1, 2006, at the San Diego Zoos Wild Animal Park. The piglets and their parents can be seen in the Nairobi Village. The red river hog is found in Africa. It is named for its reddish brown fur, and the fact that it often wades through water. These pigs are active both day and night and are good swimmers, holding their tails above the water. They can also swim underwater, catching a breath every 15 seconds or so. The Red River Hog are nocturnal animals and are most active during the night. By day, they hide in dense bushes, resting in a self-excavated burrow deep within impenetrable vegetation during the day. After sunset, they roam around in troops, in search for food. 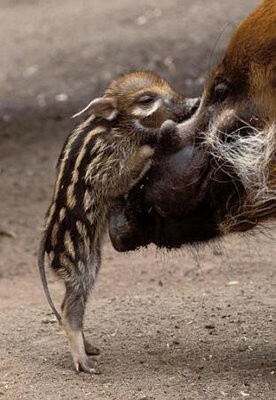 When frightened, the striped piglets crouch and "play possum". As they get older, flight becomes the more frequent response. However, when cornered or wounded, these pigs display considerable courage and frequently attack. Red river hogs are fast runners and good swimmers. They often root for tubers with their plow-like noses and can cause considerable damage to crops in a short period of time. Visit Saharan Vibe for more info and photos.